I clearly remember the day, two years ago. My first weekend in Paris, I was at a party with a bunch of French friends. Of course, our conversation lead to food, and then dessert and then to a pastry chef I had never heard of. “WHAT! You’ve never been to the Pierre Hermè (PH) store! ?” I felt like I had committed a crime by not knowing who Pierre Hermè was. “Pooja, tomorrow, you HAVE to go to this shop and get the ‘Mogador’ macaroon.” I would have never imagined that one sentence would lead to the creation of Le 15. The very next morning I found myself waiting in line outside the PH store in the 15th arrondisement. I was like an excited little child looking in through the glass windows at the most striking display of colours. I wanted to try this Mogador macaroon and decide for myself what the fuss was all about. After 15 long minutes I was finally out of the store with my very expensive purchase. I took the macaroon out of the bag and studied it for a minute. With its glossy surface and skirt (feet?) it almost looked like a mini burger. I took a bite and felt a rush of flavors playing around in my mouth. The sourness of the passion fruit coupled with the sweetness of the biscuit is the most beautiful combination I have ever tried! It was definitely love at first bite! Being back in India, I wanted to share my love for macaroons. After many trials (and errors!) we at Le 15 have managed to create an array of macaroons for sale. They are available in the following flavours: Passion fruit, Caramel, Raspberry, Black currant, Hazelnut, Mint, Coffee, Bitter Chocolate, Milk Chocolate and Rose. I tried my first Macaroon in Melbourne a few years ago. It probably was not a patch on a Parisian one but I can identify with your reaction! I am looking forward to trying your Macaroons on my next visit to Le 15. I tried the Le 15 Black Currant Macaroon at an event they were at a few weeks ago. 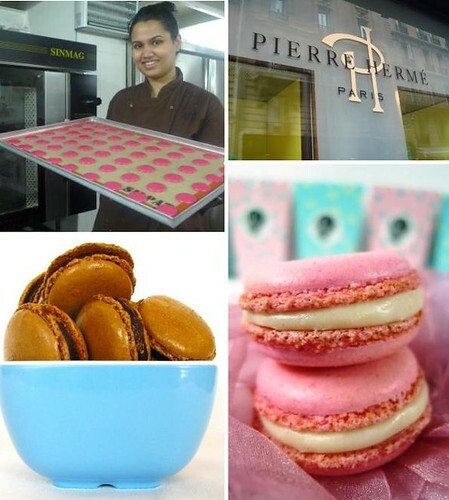 It was just as Pooja described Pierre Herme's macaroons. Simply delicious! Just popping in to say, FINALLY got to try the macaroons and I LOVE them! Surely going to pick up more as soon as I get a chance!